Beyoncé is the biggest popstar on the planet. Period. Of course, there's far more to her than just singing, as we saw on her adverts before the show for H&M, Pepsi and her own perfume. Not just commercialism, these all tie in to her persona as a strong woman - not least of all her work with the female-orientated charity Chime for Change. In fact, most of her act is built upon female empowerment. As an artist specifically, she is an incredible role-model for the mostly female audience. From the sublime vocal that growls, roars and sighs, to the flawless choreography performed in front of dazzling screens, Beyoncé is the ultimate performer. She is a woman easily objectified, but who is empowered by her sexuality. Her rendition of Flaws and All was almost laughable when, pointing at her arm, she deigned to suggest her perfectly toned bisep had an ounce of fat. The songs, too, reflect her strength. Taken from all of her albums (with a couple of favourites missing), she sang anthem after anthem - from Who Run The World (Girls), to Single Ladies (Put A Ring On It), Why Don't You Love Me and If I Were A Boy (throwing the mic stand at "but you're just a boy"). The high-octane energy only let up for the impassioned, soaring ballads. Even her band are an all-female troupe of outstanding musicians. The only men allowed on-stage are dancers Les Twins, who certainly earned their place. She also performed in multiple guises. Not only did we see Beyoncé, we saw the feisty Sasha Fierce; Mrs Carter the doting wife and mother; Beyoncé the Destiny's Child; Beyoncé the purple sparkly angel in flight. Her glittering outfits, too, took us through the ages - the regal costumes of her tour advert; the 80s Janet Jackson-esque leather; the 1920's style of Why Don't You Love Me; the 60's beehive of Countdown; the African fashions of new track Grown Woman and its jungle beats. The art direction throughout was stunning, from the film interludes to the screens the dancers interact with - and no arena show would be complete without some pyrotechnics. Yet the focus was set permanently on the central performer. It's no wonder that for many, seeing Beyoncé live is like being in the presence of a goddess. Being part of the audience, we can say "I was here". Above all, there was Beyoncé the humble 'real' woman, thanking her fans for their support, smiling throughout the show with infectious warmth. She is one woman and every woman, but on this tour she was Queen Bey. 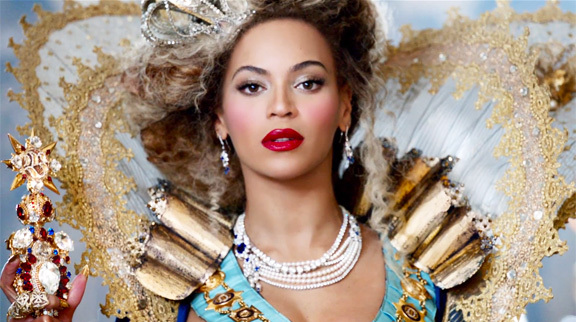 Watch: The Mrs Carter tour continues worldwide until the end of the summer.